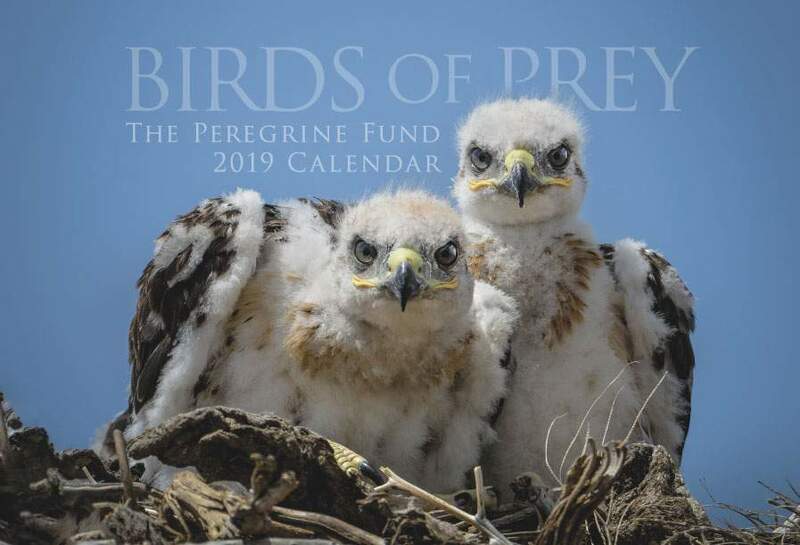 Our 2019 Calendar—now just $5 each! Order now or get one free when you donate. Though most vultures in the Gyps genus have 14 tail feathers, the Indian White-backed Vulture only has 12! About one hundred of these birds - all feeding together - can strip a 100-pound carcass in about three minutes! This is important because they are helping to contain any spread of disease by getting rid of the decaying animal, which can be a stew pot for bacteria and harmful germs. The Peregrine Fund is working hard to protect the Indian White-backed Vulture and many other vulture species around the world. The Peregrine Fund was a key player in discovering the dangers of the drug, Diclofenac, to vultures. We were also the first conservation organization to set up “vulture restaurants” in South Asia. "Vulture restaurants" are where biologists set out carcasses that had never been treated with Diclofenac so they are safe for vultures to eat. We also do a number of other important things to help protect vultures. We support local students, we work with communities to educate them about the importance of vultures, and we continue to monitor the populations to help us understand if populations are stable, rising or going down. The Peregrine Fund also helps support vultures worldwide by promoting and celebrating International Vulture Awareness Day, which is the first Saturday in September each year! You can help by celebrating this day on your own by going out and watching vultures in your area, or by encouraging others in your family, school or neighborhood to celebrate too! Not too long ago, the Indian White-backed Vulture was found throughout a large part of the Asian continent including areas in Iran, Afghanistan, Pakistan and Nepal, as well as most of the Indian subcontinent to south-central China, Indochina, and the northern Malay Peninsula. Sadly, that is no longer the case. Today, this important vulture species can no longer be found in many areas throughout much of its former range. Though you are unlikely to find an Indian White-backed Vulture in dense contiguous forests, it can be found pretty much in any other habitat type found throughout its range. It can be seen soaring high above open landscapes, including grasslands, deserts and even agricultural fields, as it searches for food; or you might spot one perched in a snag near the coast or in deciduous or evergreen forests, or one might decide to nest right in the middle of a city. Though this might sound surprising, there are many vulture species that have adapted to living side by side with humans. The Indian White-backed Vulture is not exception. In fact, it has made quite a good living hanging out in villages, towns, and cities. This intelligent creature knows not to turn down an easy meal, so it takes advantage of the many food sources to be found where humans are - such as garbage dumps and dead domestic animals, including livestock which hasn't been properly disposed of. When you think about a vulture, what is the first thing word that comes to mind? Sadly, many people think of vultures as "dirty" or "ugly" - mainly due to their feeding habits and the lack of feathers on their necks and heads. However, if it is true what they say, that "beauty is in the eye of the beholder" - then it is time for us to give this beautiful creatures another look. The Indian White-backed Vulture, for example, is quite lovely, indeed. Over most of its body it has dark, almost black, feathers. But, true to its name it has a striking patch of white feathers along its back, which are visible only in flight, or when it has its wings outstretched - such as when it is sunning. The bare skin on its head and neck ranges in color from a light pinkish hue to a redder tinge. And, it has a buffy-colored ruff around its head that makes it look like it is wearing a collar. It has dark eyes and a large dark beak. The juvenile birds are overall much darker. The Indian White-backed Vulture is often seen perched on the ground, in trees or on pylons. It sits with its neck tucked down - giving it a hunched appearance. But don't let this fool you. This vulture is an extreme long-distance traveler - scientists believe it can cover more than 300 km in a single day in its search for food, without breaking a sweat! Actually, no matter what they are doing, vultures don't sweat. In fact, they, like all other birds, don't have any sweat glands at all. So, how do vultures cool off? Though it has long been known that vultures have mostly bald heads (their heads are actually covered in small downy feathers) in order to help keep their heads clean when they eat, scientists are now looking at the vulture's bald heads in a new way. Their bald heads might also help them to stay warm or keep cool, depending on the weather. When they are cold, they can tuck their necks in, closer to their bodies, to keep them warm and cozy. When it is hot outside, vultures can extend their necks soaking up the sun's rays through the skin on their necks and heads. When it really wants to get out of the heat, taking off into flight also helps - as the cold air rushes past its (mostly) bare skin patches. In order for a vulture to be able to take off into flight, it needs to get a bit of a running start first. It flaps its wings and runs head on into the wind and gracefully lifts off into the sky. However, one researcher observed that if they have eaten too much at a carcass, they are too weighted down and unable to fly. This can be dangerous when larger predators are around - especially ones defending their kill from scavenging vultures! Though the Indian White-backed Vulture is a stunning bird, its vocalizations do leave a bit to be desired. They don't have a "call" or a "song" like many other birds do. Instead, they hiss or croak when fighting, and emit grating screeching noises when mating. One researcher, named Naoroji, likened the sound to "metal being dragged across concrete." The Indian White-backed Vulture was once considered to be one of the most numerous large raptors in the world. However, biologists began to notice a steep decline in the numbers of Indian White-backed Vultures they were observing in the mid 90's and early 2000's. One survey noted a drop of over 90% in population numbers! It took biologists a while to discover the cause of the decline, but when they did, they knew they had to act fast to prevent the loss of these beautiful birds. The main threat to the survival of these and most other vulture species across southern Asia is the use of a drug called diclofenac. Diclofenac is a medicine people give their livestock (cattle, donkeys) when they fall ill. Though diclofenac may help their animals feel better for a little while, eventually the animals will get sick again. When the cow or donkey who has been treated with this drug dies, the diclofenac remains in their system. When vultures feed on the remains of these animals, they unknowingly swallow meat and tissue that contains traces of this drug along with their meal. The diclofenac poisons the vultures, which makes them very sick. Many of them die because their kidneys fail. In 2003, The Peregrine Fund first discovered the catastrophic relationship between diclofenac and declining vulture populations in south Asia. Thankfully, the drug was banned for veterinary use in 2006 by India, Pakistan and Nepal, and Bangladesh took similar action in 2010. Sadly, despite the ban, diclofenac is still widely available in some parts of these countries and other drugs with similar effects are also still on the market. Biologists and conservationists are working hard to protect this species, but there is still a lot of work to be done! The Indian White-backed Vulture, of course, mainly eats carrion, which means it eats animals that are already dead. 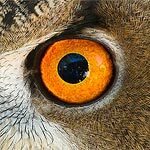 It searches for prey by soaring far and wide, using its exceptional eyesight to spot a meal. It also uses clues to help it know when food is at hand. For example, if it sees large congregations (or groups) of other raptors or scavengers, it knows it is highly likely that that there is a feast - in the form of a dead animal - somewhere nearby. The Indian White-backed Vulture is not a picky eater and will feed on the carcasses of animals as big as an elephant and as small as a fish washed up on the shore of a lake, and pretty much anything in between. It feeds on dead cows, goats, and sheep - which can be more plentiful than wild quarry. However, if it comes across an old kill made by a tiger or other large predator, it will gladly feast on that, or the remains of pretty much any large animal it can find, as well. It is also known to feed on roadkill both large and small and, sadly, sometimes individuals often becomes roadkill themselves when feeding in the middle or the side of the road. The Indian White-backed Vulture, like other vultures that share the same range, also consumes dead humans. Though it might sound strange or gross, they do this as part of a very beautiful and practical burial tradition practiced by some people in parts of Tibet, China, India, and Mongolia. It is known as a Sky Burial. Due to the very rocky ground in these areas and the lack of trees for burning, it is nearly impossible to bury or cremate the dead. So, instead, the dead are brought to a hilltop where their bodies are exposed to the elements and to vultures. Apart from the practicality of this method, there is also a very deep spiritual belief connected to it. Traditionally, this is seen as a way for the deceased to give back to the earth and to show compassion - by providing nutrients and food to other living creatures. Once food has been found, several species of vulture, including the Long-billed Vulture, will gather together at the single carcass. Individuals often spar, or fight, with each other to maintain the best position at the food source. Even though Long-billed Vultures aren't as large as other species, they usually outnumber the other scavengers, and can manage a strategic position from which to feed. Sometimes, a large carcass can be covered by 70 or more vultures - with other scavengers, such as jackals and other raptors, and even storks, vying for a bite. There are usually a lot of flies, too! As you can imagine, the scene is a cacophony of sounds and smells and fun animal behavior. Like all vultures, Indian White-backed Vultures have very few feathers on their heads. When they eat, they often need to put their heads deep into the cavities of rotting carcasses. If particles of this meat got deep into their feathers, they might cause bacteria or germs to grow. Though some people might think vultures look ugly, the fact is a bald head helps keep vultures healthy – and the more healthy vultures we have around the better. As nature's clean-up crew, vultures and other carrion eaters often consume organisms in dead and decaying animals that are harmful to humans and the environment. Yeah vultures!!! When breeding season begins, the male and female Indian White-backed Vultures will engage in wide circular flights, otherwise known as their courtship display. When the time is right, both the male and female will participate in building the nest - which is made of twigs and sticks of varying sizes and lined with some interesting materials such as leaves, fur and even dung - which is a fancy word for animal poop. 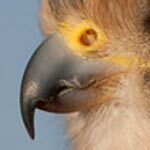 The Indian White-backed Vulture prefers to nest in large leafy trees, but it will also nest in crevices or ledges of large cliffs, or pylons. Just as many individual Indian White-backed Vultures will get together to feed, they also nest together, too. This is known as colonial nesting and, in the case of this species, around 100 nests had been recorded in small grove, and, more than 15 in one single tree! The Indian White-backed Vulture will nest almost anywhere it can find the right trees - from orchards to cities. In fact, researchers reported that birds in some areas were beginning to nest in public parks because of the loss of large nesting trees in rural areas. Once the nest is built, the female will lay usually one, but very rarely two, elliptically shaped egg, which are bright white, with few other markings, though sometimes eggs can be lightly blotched with rusty or grayish marks. Once the egg is laid, both the male and the female will work to incubate the egg, which will hatch after about 50 days, or maybe more. Once the chick hatches, the parents must work hard to bring it enough food so it will grow into a healthy bird. Vultures don't have strong talons like other birds of prey, so they can’t carry food in their feet like most raptors do. Instead, the adults store food for their young in their crop, a special pouch inside their throats where food sits before it travels to the stomach to be digested. When the adult returns to the nest, it regurgitates, or throws up, this food, which the young chick happily eats. No one knows for sure, but scientists believe that the young will stay with the adult for about 3 months until it becomes independent. The World Center for Birds of Prey offers fun ways to learn about birds of prey. Interactive activities, tours, interesting videos and a children's room with activities from coloring sheets and quizzes to costumes and a touch table are available for the curious mind. We also have several different birds of prey on display year-round, including California Condors and a Turkey Vulture. This is a great chance to see some vulture species up close. Come for a visit, where our knowledgeable staff and volunteers are on hand to answer any questions you may have about the Indian White-backed Vulture or other birds of prey. If you are in Boise at the beginning of September, get in touch with our education crew at the Velma Morrison Interpretive Center to learn about International Vulture Awareness Day activities. Photos needed! If you are a photographer and would be willing to donate photos of for use on this site, please email us.